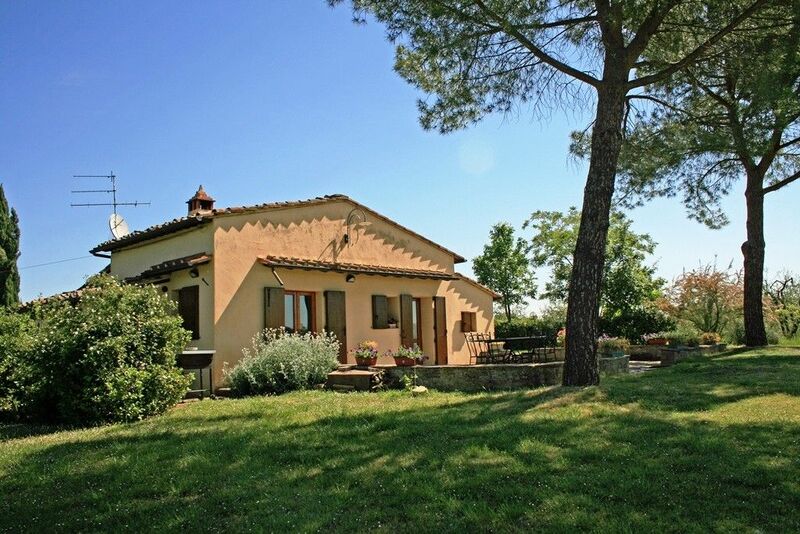 Charming little house situated in the beautiful countryside just outside the town of San Gimignano, ideal place for couples and families wishing to visit Tuscany enjoying the freedom and privacy as well as the central position that this property has to offer. The villa is an oasis of peace and tranquillity, surrounded by a very well kept garden and with stunning view over the famous towers of San Gimignano. Internally the house offers cosy and tasteful furnished spaces, whilst outside guests have at their disposal a large yard shaded by pine trees and provided with table, chairs and a barbecue for enjoying nice meals 'al fresco'. The cottage provides an excellent starting point for those who intend to visit both San Gimignano (2 km) and the other most important art centres of the region such as Volterra (25 km), Siena (30 km), Florence (40 km), Pisa 60 (km). The beaches of the Tuscan coast can be reached in about one hour by car (60 km). Ground floor - living/dining room with open fireplace - kitchen with gas hobs, electric oven, refrigerator/freezer, and access door to the garden - 1 double bedroom with adjoining bathroom with bathtub/wc - 1 double bedroom - 1 single bedroom - 1 bathroom with shower/wc. We thoroughly enjoyed our 2 weeks in Casale and were so sad to leave this morning. The peace and tranquility, large and lovely garden plus awesome views - the photos do not relay the absolute beauty of San Gimi at all hours of the day - made dining at home on the terrace a real joy. The house is comfortable and adequately equipped, with charming rustic touches and family photos of the olive harvest. It is in easy reach of Florence, Siena, Volterra, Pisa and Lucca. A completely satisfied customer is also our greatest satisfaction: thanks a lot for your appreciation! We spent a week in July in this beautiful cottage. One week is not nearly enough time to spend in this lovely place. The cottage is situated on a beautiful location with an excellent view on the historic town of San Gimignano. The owners are nice and very helpful. The cottage is very clean and well maintained. Everything was spotless and the kitchen was very well equipped, but a liitle bit small. The cottage is perfectly located for exploring Tuscany, so peaceful and relaxing to come "home" to at the end of the day. A few of our favorites are San Gimignano... the gelato at Pluripremiata and dinner at Bel soggiorno...Monteriggioni and Certaldo. Sehr romantisches Haus im Grünen mit wunderschöner Aussicht auf San Gimignano. Das Haus liegt sehr ruhig, mit grossem Garten und super Aussicht. Es war auch für unsere Familie mit Kindern super. Die Vermieter waren sehr nett. Die Küche ist zwar wirklich klein, und es gibt keine Spülmaschine, aber das waren nur winzige Sachen. Unsere Ferien waren sehr toll und die Atmosphere und alles im Haus sehr super. Das Haus war einfach, aber sehr romantisch. Ich würde das für alle Naturliebhaber empfehlen. Hügel mit Traumblick auf San Gimignano verdient 6 Sterne! Kaffeemaschine, das ist oft üblich in Italien - wir haben unsere mitgebracht. Ausserdem fehlten Liegestühle, es gab nur normale Stühle zum Sitzen im Garten. Ein grosses Lob für die Agentur und Antonio - er war sehr bemüht und immer ansprechbar. Das ist auch vonnöten, da man die Vermieter nur über ihn erreicht. Florenz, Siena, Volterra und viele andere Klöster und Orte sind nicht weit. sind - auf dem Parkplatz des Supermarktes darf man nur 1 Stunde frei parken. nicht durch die Dunkelheit gehen. auch sehr interessanten Aufenhalt gehabt. Nice house and surroundings, a Little bit isolated, no neighbours. Ideal for a family with small children, there are some swings in the garden. Good beds and bathrooms. Internet. Kitchen Equipment could be better. San Gimignano is very near may be at a distance of 5-600 meters but you have to walk on the road 2 km to come there. We were there in the end of March and the gas cost for heating was quite high, 200 Euro/week. The weather was a little bit cold compared to normal. In general we were very satisfied with our stay. Tuscany: a row of cypress trees breaking the blue sky on a rolling hilltop. Olive groves and grapevines marching tidily down the side of a slope. Little medieval hill towns gazing down upon a country that has been carefully cultivated. San Gimignano rises on a hill (334m high) dominating the Elsa Valley with its towers. The town increased in wealth and developed greatly during the Middle Ages thanks to the 'Via Francigena' the trading and pilgrim's route that crossed it. Such prosperity lead to the flourishing of works of art to adorn the churches and monasteries. The construction of the towers dates back to the 11th and 13th centuries.